We are the leading manufacturer and trader of the Stainless Steel Engraved Signages. We are the remarkable entity, engaged in offering superior quality Stainless Steel Engraved Signages are available in varied sizes, colors and the complete design is customized as per the demands and are available in various finishes. These are available with us at industry leading price. 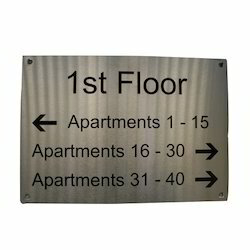 Grade Stainless Steel Engraved Signage is made of 2 mm thick 304 stainless steel with color required color weather proof. Our products are curved to perfection and lend grandeur to any entrance.